Salad onions, often called spring onions, are immature onions that are used raw in salads or as a garnish. Their small size also makes them ideal for stir-fries. You can get a worthwhile crop of salad onions from the smallest space, be it a container, small raised bed or border. They are ready to harvest in 10-12 weeks, so you can sow every fortnight in spring for a continuous supply all through the summer. Some extra-hardy varieties will overwinter, which means that you can pull your own salad onions the following spring. ‘White Lisbon’ is one of the oldest varieties and still the most popular. It has a pronounced bulb and a short white shaft. ‘Ishikura’ is a Japanese bunching onion with long white stems, but no bulb. 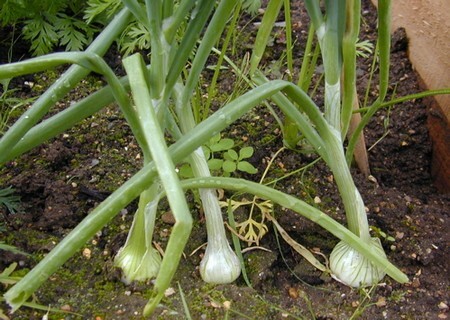 ‘Guardsman’ is a modern, bulb-less variety which is a cross between a traditional spring onion and a Japanese bunching onion. Once ready, it remains in peak condition for a long time and is claimed to be resistant to white rot. ‘White Lisbon Winter Hardy’ is an extra-hardy strain which can be sown in autumn and harvested the following spring. ‘Redmate’ is worth trying for something different. It produces bright-red spring onions and, if left, will go on to produce small onions. Pickling onions ‘Brown Pickling SY300’ is a brown variety. ‘Paris Silverskin’ has white bulbs. Make the first sowing under cloches. Start to sow outdoors from mid-March. Make several sowings, either in pots of multipurpose compost or in patches in the border. In a vegetable plot or raised bed, sow short rows or bands, once a fortnight for a summer-long supply. In pots, scatter seeds roughly 2-3cm apart, and cover with about 1.5cm of compost. In the garden, sow in rows 10cm apart and thin the seedlings to 2.5cm apart. Alternatively, sow in bands. With a draw hoe, take out a shallow drill (about 1.5cm deep and 8-10cm wide). Scatter the seed thinly so that you end up with a plant every 2-3cm, allowing about 30cm between adjacent bands. The ideal density is 320 plants per square metre, or 30 to a 30-cm square. You should get away with about 30 in a 30cm-diameter pot. 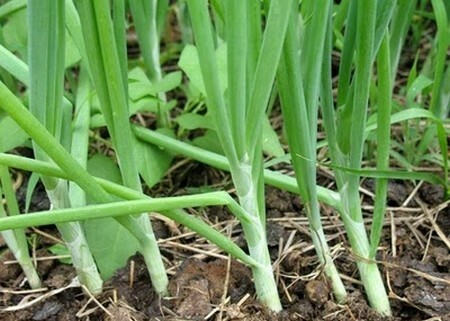 For tender, succulent salad onions, water weekly in dry weather to keep the plants growing rapidly. For an early crop the following spring, sow a hardy winter variety now. Pull bunches of plants as soon as the stems are 1cm thick. Some varieties will have a distinct bulb at the base, others will not.